ICH Blog: Announcing the 12th Annual Heritage Places Poster Contest! Announcing the 12th Annual Heritage Places Poster Contest! 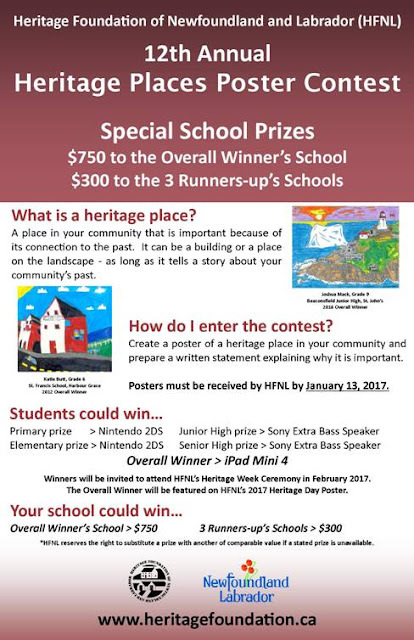 The 2016-2017 school year marks the 12th year of the Heritage Foundation of Newfoundland and Labrador’s Heritage Places Poster Contest. In addition to student prizes, the overall winner’s school will receive $750 and the three runners- up’s schools will receive $300 each. If you have any questions please do not hesitate to contact Andrea O’Brien at 1-888-739-1892. Our website www.heritagefoundation.ca and our Facebook page @heritagefoundationnl are both great resources for students.